The entire point of DC’s Injustice is to imagine a universe in which traditional canon is basically thrown out of the window in favor of a riveting series of what ifs. What if Superman became tyrannical despot? What if everyone had super strength? What if... Booster Gold and the Blue Beetle were lovers? In the most recent issue of Injustice 2, the entire world is forced to watch as Ra’s Al Ghul tortures and eventually kills Ted Kord, the second Blue Beetle. As one of his first steps towards taking over the world, Ra’s broadcasts the horrific scene as Orca and Killer Croc viciously tear into Kord’s body. While Batman, Black Canary, and Green Arrow frantically try to figure out where Ra’s is keeping him, Kord eventually accepts his fate and begins to wait for death. The comic’s dark tone is interrupted, though, when Booster Gold suddenly teleports to Kord’s side and explains that there was no way that he could have manipulated the universe’s events to save his friend’s life. Kord makes Booster to promise to watch over Jaime Reyes, something that Booster isn’t entirely sure he’s well suited for. In their final moments together, Booster and Kord share a couple of jokes; just as Kord’s about to die, Booster gives him a tender kiss on the forehead and teleports away. There’s nothing in Injustice 2 that explicitly alludes to either Booster Gold or the Blue Beetle having ever had a romantic relationship with one another and considering the circumstances, the kiss isn’t exactly out of place. But. 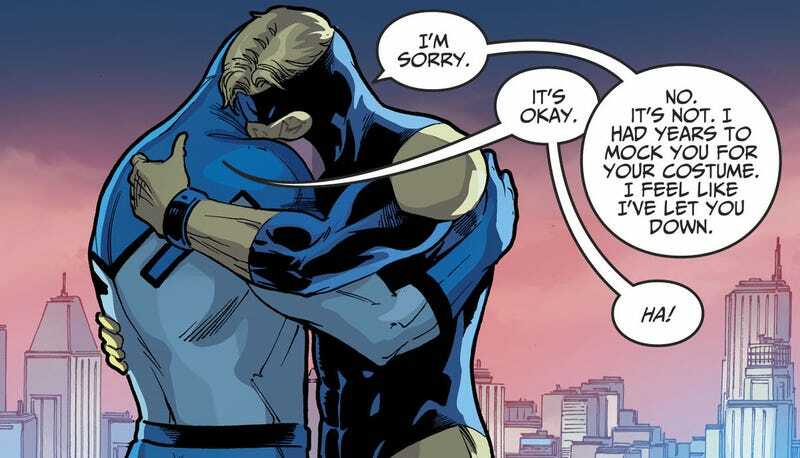 1) This is a parallel universe where all things are possible and 2) Booster Gold and Blue Beetle’s friendship has always had a fairly strong queer, tragic subtext to it. As DC writer Meg Dowdy accurately pointed out on Twitter, Booster and Lord have an established history of trying to save each other’s lives before being forced to watch each other die. In the past, Booster Gold and Blue Beetle have typically been depicted as a slapstick-y buddy duo who provided the Justice League with a much-needed infusion of comedy whenever Batman broody darkness got to be too much. A romantic relationship between the two of them would be a major break from DC’s canon, but it wouldn’t be the most confusing pairing to wrap your mind around. While Kord’s Injustice 2 death doesn’t exactly shake up the whole “let’s watch each other die and be sad about it” formula, the kiss does, in an interesting way, beg the question what if? What if Booster and Ted had the chance to leave superhero-ing behind and live regular lives? What kind of people would they be? What kind of lives would they live? Would their friendship turn into something more under the right circumstances? "They Had To Keep Reinventing This Character Until They Got It Perfect"